Following your 8:30 pick up we’ll take a short, easy walk for a close-up and personal view of the magnificent Exit Glacier. 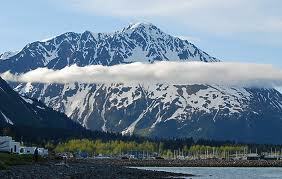 As we leave the Seward area and tour north, we’ll see the spectacular scenery of Moose Pass and Turnagain Pass. This area is well regarded for its dramatic alpine scenery and hanging glaciers. After descending down to the shores of Cook Inlet, we’ll visit the Alaska Wildlife Conservation Center, opened to the public in 1993. It is located on 140 acres at the southern edge of Turnagain Arm and the entrance to Portage Valley. The Alaska Wildlife Conservation Center provides wildlife education and awareness, and care and rehabilitation for Alaska’s wildlife. Get close, safely observe and photograph some of Alaska's largest land animals, including moose, bison, elk, deer, caribou, bears, and musk ox. Our guests also enjoy seeing small mammals like lynx, and stunning birds of prey, such bald and golden eagles.